The closer to nature manual breast pump comes in just 3 pieces ensuring quick and easy assembly. The breast pump has massage ripples that encourage fast, comfortable milk let down. The manual operation means it is descreet and easy to control for a comfortable level of suction. Make it easy to give your baby all the benefits of your breast milk, even when you’re not there, with the closer to nature manual breast pump. 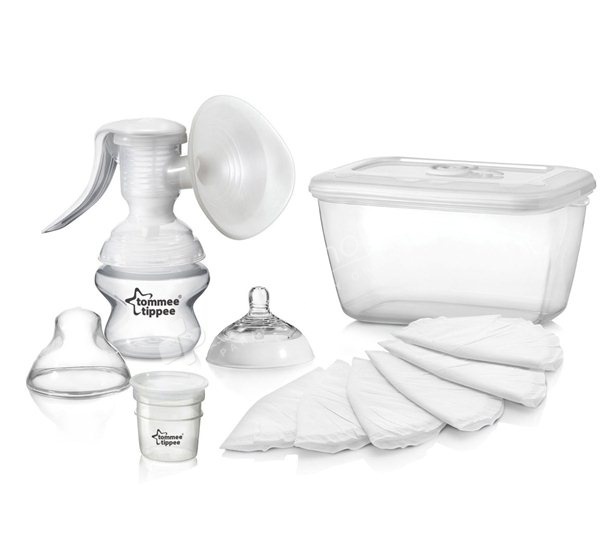 The Closer to Nature Manual Breast Pump comes in just 3 pieces, making it quick and easy to assemble and clean. These Manual Breast Pump features a soft-touch silicone cup with special massage ripples that encourage fast, comfortable milk let-down. The manual operation means it’s quiet, discreet and easy to control, ensuring you achieve just the right level of suction. Soft Touch Flexible Cup: The soft touch, flexible cup encourages fast, comfortable milk let down and also comes with massage ripples for extra comfort. Easy to Use / Clean / Assemble: The simple and intuitive design of the Closer to Nature breast pumps makes them easy to assemble, use and sterilise. Manual Operation: The manual operation of the Closer to Nature Manual Breast Pump means it is discreet and easy to control. 2 x milk storage pot. 6 x disposable breast pads.